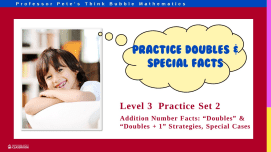 A mixture of addition and subtraction facts for students who are ready to memorize all the facts to 20, and are drilling for greater speed, or learning extended facts that go beyond the basic facts. 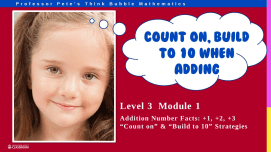 Revision of the strategies of “Count on” and “Count back” by 1. Space is included to record student’s time and accuracy. Revision of the strategies of “Count on” and “Count back” by 2. Space is included to record student’s time and accuracy. Revision of the strategies of “Count on” and “Count back” by 3. Space is included to record student’s time and accuracy. Revision of the Rainbow strategy. Space is included to record student’s time and accuracy. Revision of the special cases +0, +10. Space is included to record student’s time and accuracy. Revision of the strategy of “Doubling” or “Halving”. Space is included to record student’s time and accuracy. 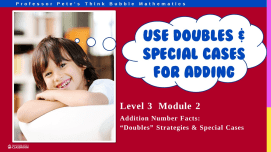 Revision of the strategy related to “Doubles +1”. Space is included to record student’s time and accuracy. Revision of the “Near 10” strategy for +9 facts. Space is included to record student’s time and accuracy. Revision of the “Near 10” strategy for +8 facts. Space is included to record student’s time and accuracy. Revision of the remaining facts 7+4 and 7+5. Space is included to record student’s time and accuracy. Set of 5 assessment tests to check on how students are progressing with each of the units in the Addition Facts series of worksheets. 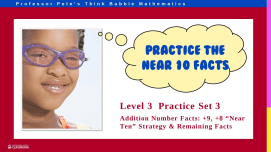 Set of 20 homework sheets to match each of the sets in the Addition Facts series. Contains information for parents.